Brazil's Paulo Junior scores two goals to spark home win. Chris Detrick | The Salt Lake Tribune &#xA;Real Salt Lake midfielder Luis Gil #21 runs around Cruz Azul's Joel Huiqui Andrade during the first half of the game at Rio Tinto Stadium Tuesday October 19, 2010. Real Salt Lake is winning the game 1-0. Chris Detrick | The Salt Lake Tribune &#xA;Real Salt Lake forward Paulo Araujo Junior #23 scores a goal during the first half of the game at Rio Tinto Stadium Tuesday October 19, 2010. 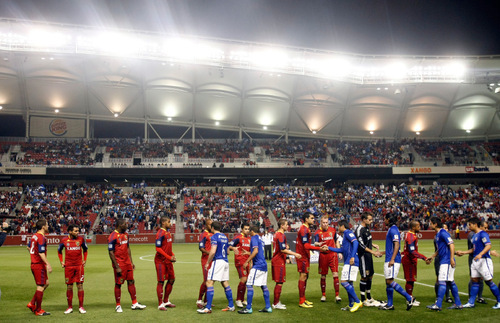 Real Salt Lake is winning the game 1-0.&#xA; Chris Detrick | The Salt Lake Tribune &#xA;Members of the Cruz Azul and Real Salt Lake shake hand before the start of the game at Rio Tinto Stadium Tuesday October 19, 2010. Real Salt Lake is winning the game 1-0. Chris Detrick | The Salt Lake Tribune &#xA;Members of the Cruz Azul and Real Salt Lake walk onto the field before the start of the game at Rio Tinto Stadium Tuesday October 19, 2010. Real Salt Lake is winning the game 1-0. Chris Detrick | The Salt Lake Tribune &#xA;Real Salt Lake forward Paulo Araujo Junior #23 celebrates after scoring a goal during the first half of the game at Rio Tinto Stadium Tuesday October 19, 2010. Real Salt Lake is winning the game 1-0. Chris Detrick | The Salt Lake Tribune &#xA;Real Salt Lake forward Paulo Araujo Junior #23 and Real Salt Lake midfielder Collen Warner #26 celebrate after Junior after scoring a goal during the first half of the game at Rio Tinto Stadium Tuesday October 19, 2010. Real Salt Lake is winning the game 1-0. Chris Detrick | The Salt Lake Tribune &#xA;Real Salt Lake forward Paulo Araujo Junior #23 Real Salt Lake midfielder Collen Warner #26 Real Salt Lake defender Rauwshan McKenzie #30 and Real Salt Lake midfielder Luis Gil #21 celebrate after Araujo scored a goal during the first half of the game at Rio Tinto Stadium Tuesday October 19, 2010. Real Salt Lake is winning the game 1-0. Chris Detrick | The Salt Lake Tribune &#xA;Real Salt Lake forward Paulo Araujo Junior #23 celebrates after scoring a goal during the first half of the game at Rio Tinto Stadium Tuesday October 19, 2010. Real Salt Lake is winning the game 1-0. Chris Detrick | The Salt Lake Tribune &#xA;Real Salt Lake forward Paulo Araujo Junior #23 celebrates after scoring a goal during the first half of the game at Rio Tinto Stadium Tuesday October 19, 2010. Real Salt Lake is winning the game 1-0. Real Salt Lake forward Pablo Campos #19 is in the background. Chris Detrick | The Salt Lake Tribune &#xA;Cruz Azul's Horacio Cervantes and Real Salt Lake forward Pablo Campos #19 during the first half of the game at Rio Tinto Stadium Tuesday October 19, 2010. Real Salt Lake is winning the game 1-0. Chris Detrick | The Salt Lake Tribune &#xA;Real Salt Lake forward Pablo Campos #19 kicks around Cruz Azul's Joel Huiqui Andrade and Cruz Azul's Horacio Cervantes during the first half of the game at Rio Tinto Stadium Tuesday October 19, 2010. Real Salt Lake is winning the game 1-0. Chris Detrick | The Salt Lake Tribune &#xA;Real Salt Lake forward Pablo Campos #19 kicks around Cruz Azul's Joel Huiqui Andrade and Cruz Azul's Horacio Cervantes during the first half of the game at Rio Tinto Stadium Tuesday October 19, 2010. Real Salt Lake is winning the game 1-0. Chris Detrick | The Salt Lake Tribune &#xA;Real Salt Lake goalkeeper Kyle Reynish #24 dives to save the ball during the first half of the game at Rio Tinto Stadium Tuesday October 19, 2010. Real Salt Lake is winning the game 1-0. Chris Detrick | The Salt Lake Tribune &#xA;Real Salt Lake midfielder Collen Warner #26 runs around Cruz Azul's Gerardo Torrado during the first half of the game at Rio Tinto Stadium Tuesday October 19, 2010. Real Salt Lake is winning the game 1-0. Chris Detrick | The Salt Lake Tribune &#xA;Real Salt Lake forward Paulo Araujo Junior #23 kicks around Cruz Azul's Horacio Cervantes and Cruz Azul's Julio Cesar Domínguez during the first half of the game at Rio Tinto Stadium Tuesday October 19, 2010. Real Salt Lake is winning the game 1-0. Sandy • Paulo Junior and Pablo Campos, teammates and countrymen, danced a little jig together at the corner flag. Paulo had just scored the goal that launched Real Salt Lake to its 3-1 victory over Cruz Azul of Mexico in the CONCACAF Champions League in front of another record crowd at Rio Tinto Stadium on Tuesday night, and at the same time took his fellow Brazilian off the hook for missing a penalty kick. 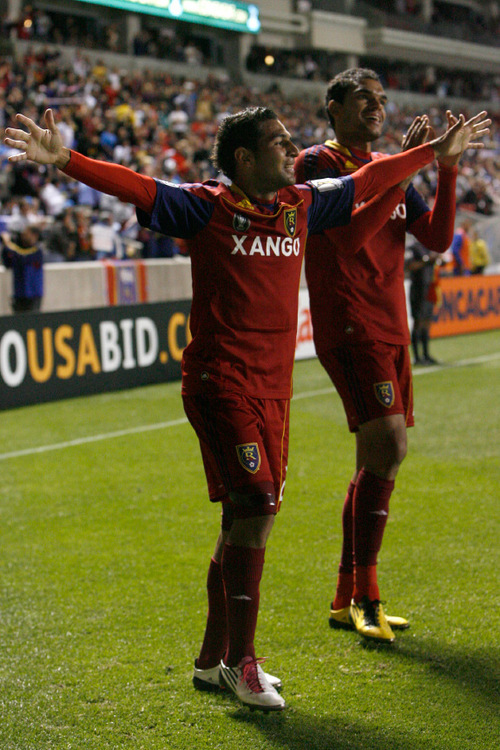 In the end, Paulo scored twice, and rookie Collen Warner added an insurance goal to help RSL win its Champions League group and clinch home-field advantage for the tournament quarterfinals  in spite of playing one of the most storied teams in Mexico with a makeshift lineup comprising mostly reserves, to preserve the starters for their important Major League Soccer game at Colorado on Saturday. "I just can't say enough about the contributions of the players that come in," coach Jason Kreis said. "All of them have stepped up, big-time. There's a lot of unsung heroes there." The victory extended RSL's home unbeaten streak to 32 games in all competitions, and avenged a wild 5-4 loss at Cruz Azul amid a torrential rainstorm in Mexico City in August. It also came in front of 20,463 roaring fans  many of them waving blue-and-white Cruz Azul flags  who comprised the largest crowd in Rio Tinto Stadium history, surpassing by 227 the previous record set just last weekend. "Huge win," Warner said. "There was a little bit of added pressure because we put out what you could say is not the strongest side that we have. But our coaches believed in us for this game and thought we could get the job done, so it was great. The crowd was great, too." Cruz Azul needed only a draw to claim the group title, and the eight-time Mexican champions took the field clearly intent on winning. 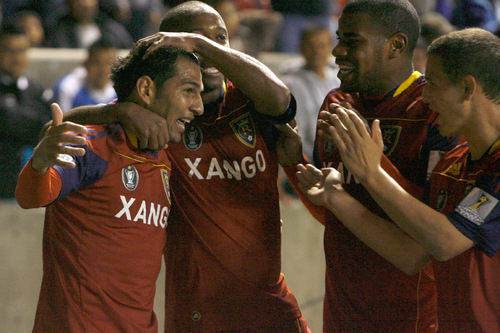 Its lineup was close to first-choice, and it pressured RSL hard from the outset. And when goalkeeper Yosgart Gutierrez dived to his right to deny Campos on a penalty kick in the 32nd minute, it appeared it might have good fortune on its side. But Los Cementeros did not have Paulo. The 21-year-old on loan from Miami FC split two defenders in the 43rd minute to run onto a pass from Warner and chip a shot over the sliding Gutierrez for the goal that changed everything. Suddenly, Cruz Azul was back on its heels, and RSL was gaining confidence. Paulo scored again off a perfect cross from Robbie Findley in the 67th minute, and Warner knocked home an easy one-on-one opportunity from Andy Williams only two minutes later. 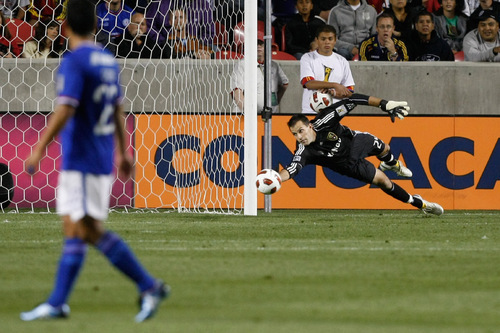 Cruz Azul's Cesar Villaluz pulled one back with a curling shot from distance in the 71st minute, but RSL goalkeeper Kyle Reynish stoned Javier Orozco on a point-blank shot near the finish to kept the visitors from coming any closer. "Everybody was fantastic," said midfielder Will Johnson, who played right back for the first time, with defenders Chris Wingert and Robbie Russell out with injuries. 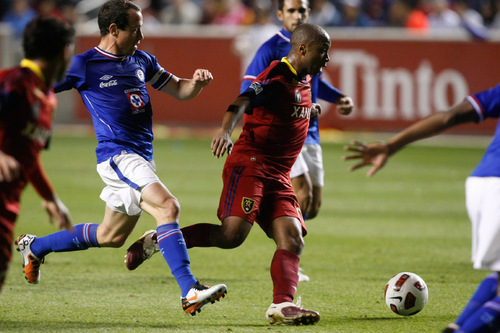 R IN SHORT • RSL beats Cruz Azul 3-1 to win its group in the CONCACAF Champions League. KEY STAT • Forward Paulo Junior has scored three Champions League goals for RSL. P RSL at Colorado Saturday, 7 p.m.